German utility RWE has kept uneconomic lignite plants open with the explicit intention of securing a public bail-out, argue Julian Schwartzkopff, Chris Littlecott and Sabrina Schulz at E3G. It would apear the energy giant has taken a bet on being “too big to fail” that might just pay off: RWE is set to be the biggest beneficiary of a new 2.7GW capacity reserve in Germany which will pay lignite plants for going on standby. The alternative, a climate levy that would have penalised lignite plants, was dropped by the government. The new plan has yet to be approved as state aid by the European Commission. On 1 July 2015 the German government agreed to introduce a new strategic reserve instead of the previously-proposed climate levy. The financial markets saw this as a successful result for the aggressive lobbying strategy of energy utility RWE, with the group’s shares seeing an immediate increase in value of 6.4%. 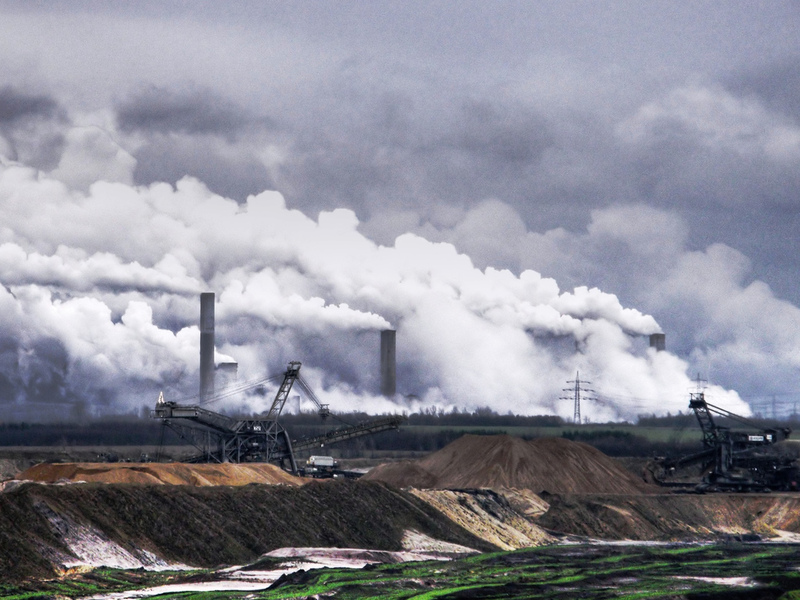 Instead of facing additional costs for its dirtiest lignite power stations, RWE will now be paid by German taxpayers to withdraw these plants from the market. If introduced, this approach would perversely reward RWE for its past record of economic mismanagement and opposition to climate policies and energy market reforms. But the European Commission still needs to consider whether the strategic reserve is compatible with regulations that limit state aid to failing companies. The Commission must therefore scrutinise RWE’s recent actions. The recent reality has been that RWE is losing money on many of its old and inefficient lignite plants. Despite having committed to deep cost reductions amid falling profits and massive write-downs, the company has resisted calls to close them. Our new analysis suggests that RWE has kept uneconomic lignite plants open with the intent of receiving a public bail-out. RWE is losing money on many of its old and inefficient lignite plants. RWE said in 2015 that their total conventional generation fleet was making zero cash. When day-to-day capital expenditure like the costs for maintaining and upgrading equipment are included, their entire 43GW conventional generation portfolio is cash-flow neutral. RWE is losing money on many of its old and inefficient lignite plants. It has kept these open with the intent of receiving a public bail-out. RWE’s CEO, Peter Terium, has admitted that 35 to 45% of their current conventional fleet is unprofitable. (See slide 8 of the RWE presentation “Paving the way for growth with continued focus on financial discipline”. The conventional fleet includes fossil fuel as well as nuclear power plants.) Proponents of lignite power generally argue that lignite is the only profitable and secure domestic energy source that Germany has left. However, the current difficulties of RWE, which owns almost half of Germany’s lignite capacity, show that this is not automatically true. Many of RWE’s older lignite plants are likely part of this collection of plants that are operating at a loss. 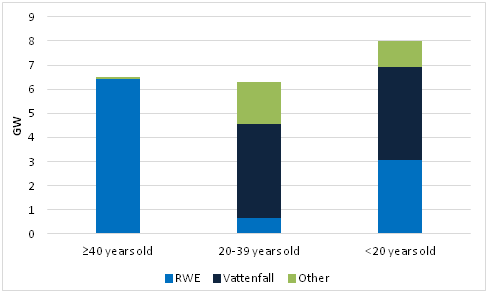 RWE’s 300MW lignite units are almost certainly unprofitable. Back in 2013, the CEO of RWE Generation said that their 300MW lignite units have “massive difficulties to earn their full costs.” At that time, the electricity price was at €38/MWh. Today, with power prices 16% lower at €32/MWh, it is almost certain that these power stations are unprofitable. RWE currently has 11 such units, all of which are more than 40 years old. The situation seems to be particularly bad regarding RWE’s oldest units in Niederaußem, Weisweiler and Frimmersdorf. In May 2015, RWE (alongside MIBRAG and Vattenfall) disclosed their cost structure to investment bank Lazard. Lazard subsequently aggregated and published the data providing an insight into the profitability of these companies’ lignite. E3G estimates that the electricity generation costs at these three power stations lie in the range of €27 to €43/MWh (see Figure below). Compared to current and forward electricity prices of €32/MWh it is highly questionable whether these units are profitable. The difference between the lower and upper estimates is “fixed fuel and mining costs”. These relate to costs such as machinery and land purchasing. In the short-term, many of these costs may not be avoidable. However, in the medium-term, most of them should be avoidable – not least because closing the oldest units will leave more lignite for the remaining units, making further expansion of mines unnecessary. Vattenfall has already recognised this, and stopped future expansion of mines. 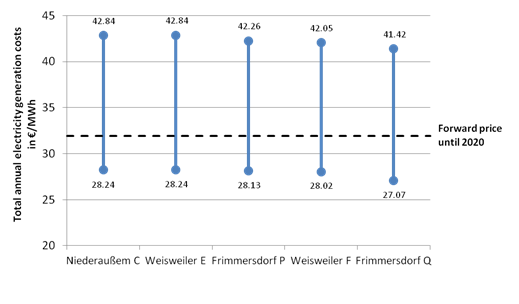 Since this data was published as late as May 2015 it can be assumed that it already includes the extensive cost-cutting measures that RWE has conducted over the last few years. This leaves little ambiguity that – if these units are not unprofitable – they are at best operating at the margin of profitability. RWE outage data furthermore reveal that 4 of RWE’s most inefficient lignite units are each having major outages this year, lasting at least 5 weeks (gathered from outage data published by RWE). Regular outages are mandated for maintenance reasons. Extraordinarily long outages like in this case imply that a lot of maintenance work with high capital expenditure is necessary to retain the operating permit. All this is despite RWE announcing, back in 2013, that it would undertake “selective capex” after suffering the worst operating results in the company’s history (see slide 12 of their presentation “3 steps to long term value”). Selective capital expenditure implies that units not justifying capital expenditure would be closed. The company has indeed enacted stringent cost-cutting measures. However, its old lignite plants seem to be exempt. As part of the cuts, RWE is currently looking to close over 8GW of capacity until 2016. Yet only 150MW of this comes from lignite, and from the company’s two smallest units at the Goldenberg power station. At the same time, RWE has shut down over 3.7GW of much less polluting gas stations. RWE has continually sought to keep old lignite stations open over the past few years. From a normal business perspective, it is surprising that RWE has not already decided to close these old lignite power stations – especially since the market outlook for lignite in Europe and Germany is only set to become worse. This approach can therefore be interpreted as a deliberate attempt to force the hand of policy-makers. Right now, it appears that this strategy has partially paid off. According to an agreement by the government coalition on 1 July, Germany is now going to introduce a 2.7GW capacity reserve where lignite plants will essentially receive subsidies for going on standby. This measure replaces the climate levy, a much more ambitious proposal which would have fined the operators of inefficient lignite stations for polluting beyond certain emissions thresholds. Based on the currently available evidence it appears that the strategic reserve is principally a means of bailing out RWE’s business model. It would appear that RWE has taken a bet on being too big to fail, by keeping old lignite plants open long past their economic due date, trusting that the government would be willing to bail them out with a capacity mechanism if necessary. This might have seemed like a safe bet. After all, RWE has systemic importance in certain regions of Germany. Particularly in North-Rhine Westphalia, suppliers and jobs, but also municipalities owning shares in RWE, depend on its lignite mines and power stations. This enabled RWE to run a frontal assault on the climate levy, together with the energy and energy-intensives union (IG BCE) and local politicians in affected regions. The new measure will now lighten the emissions reduction burden for the power sector while shifting the costs from utilities to taxpayers. RWE is set to be the single largest beneficiary of the reserve. According to the German Institute for Economic Research (DIW Berlin), old RWE lignite plants will likely account for roughly 1.5 GW of the 2.7 GW reserve. According to German Energy Minister Sigmar Gabriel, the level of capacity payments will be €230m per year. If this money is allocated proportional to the capacity provided, this would mean that RWE could receive about €130m per year from German taxpayers. This is not peanuts for the company – it amounts to 13% of the 2014 operating result from its entire conventional generation business (before day-to-day expenditure, taxes, etc. are subtracted). But this is significantly less than RWE was hoping for. Across Europe, a number of utilities have complained about lost profits, which have principally resulted from a combination of the economic crisis, structural overcapacity and their own incompetence. RWE has notably been at the forefront of these calls for support, which have typically claimed that there is a need for governments to act to ensure that “the lights stay on.” Capacity mechanisms have therefore emerged as a convenient fig leaf that disguises recompense to generators as a means of addressing security of supply concerns. The European Commission has however rightly warned of the negative impacts such measures would have on the internal energy market, and has set out guidance that would limit negative impacts. More recently, in April 2015, the European Commission announced a sectoral investigation into proposed capacity markets spanning 11 EU member states. With increased regional cooperation on electricity transmission and interconnection, the Commission is keen to ensure that national capacity measures do not distort market signals, and are compatible with EU decarbonisation objectives. This investigation already includes Germany, so the proposed new strategic reserve is already slated for review. This was acknowledged by the German government in its announcement on the new agreement, stating that it is committed to “clarifying compatibility with EU state aid regulations with the EU Commission”. It would appear that RWE has taken a bet on being too big to fail. After all, it has systemic importance in certain regions of Germany. Based on the currently available evidence it appears that the strategic reserve is principally a means of bailing out RWE’s business model, with the lifetime of old lignite plants deliberately lengthened in an attempt to secure financial support. It isn’t the fault of taxpayers and consumers that RWE pursued a high-carbon strategy and then dug its heels in to defend it. This is a bad use of public money. RWE shouldn’t celebrate too soon. “this approach would perversely reward “Greece” for its past record of economic mismanagement and opposition to ……. market reforms”. I see German politicos like to take their hypocrisy neat (no water). It is also encouraging to see that whilst capitalism and austerity is good for citizens, serfs & sheeple, corporates can always count on socialism from the state. One wonders if the EU/EC and member states can stoop any lower,…. probably. This article seems to be spot on. I always found it strange that they wouldn’t shut down their oldest lignite plants as their newer plants would have profited from higher wholesale prices. So giving up half of their lignite electricity production should almost be cost neutral and achieve getting rid of old liabilities. But of course they were out to get taxpayer money. RWE feels entitled to that. It is the way they think. I’m sure they still hope for much more even though the coalition has signalled them that this was the last time of getting a handout for destroying our ecosystem. With every passing year and their plunging share price and operating capacity this bet does get riskier. It may seem counter-intuitive that producing electricity from low-cost lignite could drive RWE into bankruptcy. However, the company’s long-term mining and generation infrastructure must contend with the growing surplus of grid power from renewable energies. RWE will not succumb to this transitional development, but existing capacities must be pared down. Nevertheless, it would be mistaken to assume that RWE had always pursued a high-carbon strategy. After all, it began experimenting with CO2-free fossil fuel power generation many years ago and funded the corresponding research at MIT. The technology was later rejected by the company on economic grounds at about the same time that CCS was cemented into the European Commission’s decarbonization policy. Power companies throughout the EU were then told that they could plan and build coal-fired generation plants as long as they were “capture ready”. The German Social Democrats exist in symbiosis with RWE. Lignite usage is therefore an important reason that Germany does not have a one-party government. By all accounts, the mining union IG BCE has authored the new power industry bail-out model. If that indeed proves to be a “bad use of public money”, German taxpayers could begin to question the government’s decision to rubber-stamp union proposals. Even so, certain power companies have apparently been speculating on similar prospects at a European level for some time. MIBRAG’s owner EPH bought not only the old Buschhaus lignite power station in Lower Saxony in 2013, but also E.on’s coal and gas fleet in Italy and Eggborough in the UK. Using government funds to retire outdated centralized power plants is similar to mothballing battleships. These behemoths were all built in the age before globalization. Miners and sailors alike may now find jobs in the burgeoning renewable energy industry. Letting RWE go bankrupt, on the other hand, would not be an option unless taxpayers wished to assume the financial responsibility for nuclear phase-out and lignite mining reclamation. A few years farther down the road, RWE’s “past record of economic mismanagement” might then seem like a golden age of corporate sobriety compared with a nationalized power company under the control of politicians and union officials who were signatory to a blank public check book. Not so sure about your final para Mr Michel – particularly the final sentence. I thought it a rather cheap point. Taking another EU MS I’d assert that the golden age for the UK was when “a nationalized power company (was) under the control of politicians and union officials” – when it did return a profit to the UK treasury and did not have a “blank public check book”. Of course this is no longer the case – most of the energy companies in the UK are foreign owned, don’t pay taxes but have manipulated markets such that the UK has the highest wholesale and highest energy only prices in Europe. Still, this fits with a neo-con view of the world where corporates get gov’ socialism and the plebs get capitalism. RWE fits in this scenario perfectly. If the German gov’ had an ounce of sense (they don’t) they would let it fall on its face – “pour encourage les autres”. By the way, I’m a capitalist that buys into the (yes I know it’s a bit radical for these times) letting large companies fail – perhaps you have a different view? It appears contradictory that a comment on the perils of a nationalized lignite industry under the control of politicians and union officials could qualify as a “cheap point”, if you likewise maintain that the German government has no sense of judgment. My remark referred particularly to the long-term costs of mining reclamation and nuclear waste storage that have not yet been comprehensively assessed. It is therefore questionable whether these liabilities could even be legally nationalized. If that were the case, however, subsequent cost overruns would necessarily be covered under authority conferred by German Parliament. The additional work involved would also be performed by unionized workers. If these activities could turn a profit, however, then there would no need to consider their nationalization. The government is currently attempting to avoid that necessity by providing public funding for retiring power plants that are already at the end of their service life. The claim that they could be reactivated if required to maintain grid stability presumes a degree of operating flexibility for which these units were never designed. To complicate the issue, collaborative research performed for the State of Baden-Württemberg indicates a severe grid supply deficit beginning in Southern Germany in 2018 and spreading to the rest of the country. Under this circumstance, the German government would likewise be disinclined to assume any risks that RWE shareholders might still be willing to absorb under the speculative premise that miscalculations on the Energiewende will inevitably benefit the company. “long-term costs of mining reclamation and nuclear waste storage that have not yet been comprehensively assessed”. Whether they have been assessed or not – RWE does not have either reserves or a balance sheet able to cover any of this (ditto EON). Thus the issue is “when” not “if” the German gov’ “steps up to the plate” wrt socialising externalities caused by corporations. Regarding the issue of “legal” nationalisation – given the above – this point (your point) is irrelevant. Anyway, I was not talking about “legal nationalisation” I’m talking about letting RWE (& indeed EON) fail. This would be a good message to others The German gov’ could then pick up the pieces – which it will have to do anyway wrt to post-operational liabilities that neither company has the resources (or intention – we are talking corporatists here) to cover. BTW: comments about “unionised workers” in these circumstances are irrelevant – & perhaps an intentional distraction? BTW: my experience of working (as management) in unionised environments has been wholly positive wrt unions in general and unionised work forces. Discounting the influence of unionized workers in German energy policy overlooks the regular participation of the mining union IG BCE in its formulation. The current plan for converting 2.7 GW of lignite power plants to reserve capacities – removing them from active service and eliminating 12.5 Mt/a of CO2 – emerged from consultations between the IG BCE and the government of North Rhine-Westphalia. The role of the unions will soon be tested in eastern Germany with the upcoming sale of Vattenfall’s lignite assets that include five lignite mines and power plants at four different locations. None of these plants appears to be making a profit, leading to the refund of commercial taxes paid in 2014 to local communities. The 23 municipalities that are part owners of RWE in the Rhineland are likewise affected by declining dividend income. The second eastern German mining corporation, MIBRAG, recently announced the cancellation of a 660 MW power plant project as well as of deliveries to the Czech Republic that would have accounted for a quarter of annual lignite output. The buyer of Vattenfall’s lignite holdings in the East would likely be interested in reducing the workforce as well as skirting the issue of sulphate contamination from mining groundwater that soon may be affecting drinking water quality in Berlin. It will be revealing to see whether these intricate issues can be resolved to the mutual satisfaction of the companies, the unions, and the taxpayers at large despite overall declining revenues from lignite power generation.